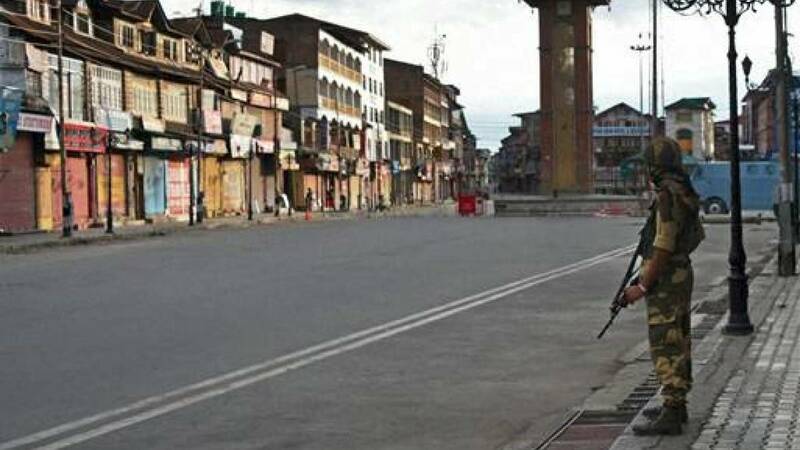 New Delhi : Curfew was imposed in all 10 districts of the Kashmir Valley on Tuesday on the occasion of Eid. Drones, helicopters were keeping a vigil on the valley. The valley has been witnessing unrest for more than two months leaving 75 dead so far due to the widespread violence. Army troops were also stationed at the sensitive points where violence was erupted in past. It may be noted here that this is apparently for the first time that curfew is imposed on the occasion of Eid. Moreover this is for the first time in 26 years, no Eid prayers were offered at the Idgah and Hazratbal shrines. # Helicopters and drones are keeping an eye on the Kashmir valley from the skies. # Even after curfew imposed in Kashmir, people were allowed to offer Eid prayers in local mosques. # Shutdown of Internet services of all telecom networks have been ordered by the government. # A clash broke out between an unruly mob and security forces, which led to a death of three people who was protesting in Kashmir's Bandipora district on Tuesday. # Violence broke out on Tuesday after a mob gathered after offering Eid prayers, and created violence. # Separatists have called to block a national highway in the Valley.